Meet the 4th winner of Hollywoodbets' 2017/18 El Clasico promotion, Lucas Ngxabi from Tembisa! 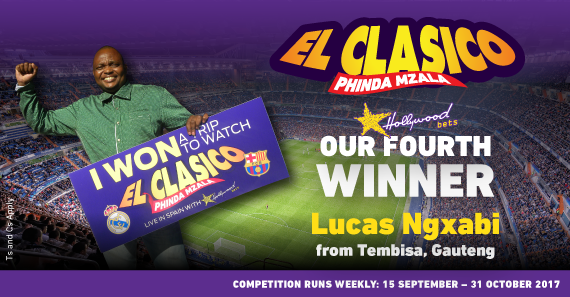 Congratulations to the fourth winner of Hollywoodbets' El Clasico promotion - Lucas Ngxabi from Tembisa! Tembisa resident Lucas Ngxabi was thrilled to hear that he will be travelling to Spain this December thanks to Hollywoodbets’ latest competition. The company is giving six soccer fans the chance to experience El Clasico - the world’s most famous soccer derby featuring Barcelona and Real Madrid that will take place in Madrid at the end of the year. This opportunity comes at a fantastic time for 38-year-old Ngxabi as he is currently unemployed, and the all-expenses paid trip gives him a lot to look forward to. “I’ve never flown before so I’m quite excited and also a bit nervous. This is the first time that I’ll be travelling out of the country. I am looking forward to meeting the people who live there, but most of all I’m so excited to see the game!” he said. Wayde Dorkin can’t wait to treat Ngxabi to this amazing experience. “Lucas is a Ronaldo fan, and I know he won’t forget the first moment he sees his favourite player on the field representing his favourite team! Our April El Clasico winners couldn’t rave enough about the experience so I’m confident it will exceed his expectations,” said Dorkin.